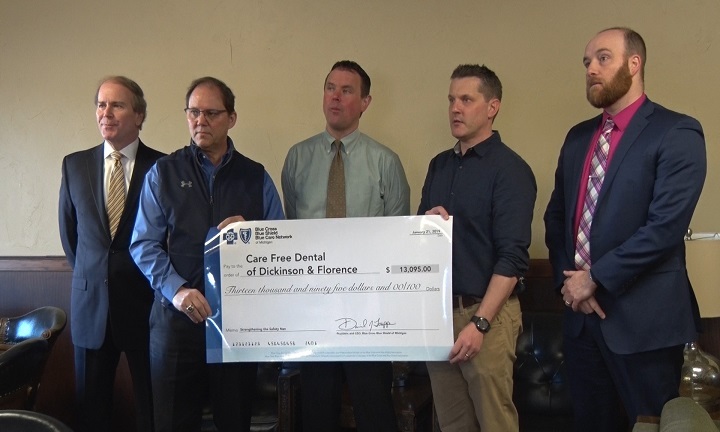 IRON MOUNTAIN — Blue Cross Blue Shield of Michigan presented more than $13,000 to an Iron Mountain clinic on Monday, Jan. 21st, to provide dental care to uninsured residents. The organization awarded a $13,095 grant to Care Free Dental Clinic of Dickinson and Florence Counties. The grant funding will help improve access to dental care for uninsured and under-insured area residents. According to the 2018 County Health Rankings, six percent of Dickinson County residents under the age of 65 are uninsured and were unable to access dental care within the last year. The grant will support Care Free Dental Clinic of Dickinson and Florence Counties’ work providing free dental exams, x-rays and treatment to vulnerable community members as needed.